I'll be the first person to admit that this is not the most exciting thing I've ever posted here. It's actually just a quick sketch I did because the class I was in today was very very boring. However, it's here for a good reason. 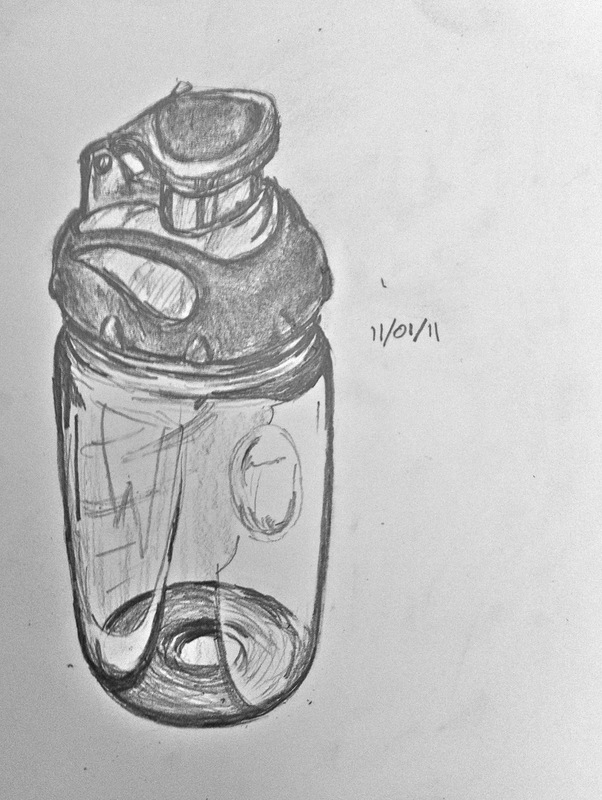 It's one of the first things I've ever drawn in which I focused on the textures and materials of the object, instead of just it's shape. 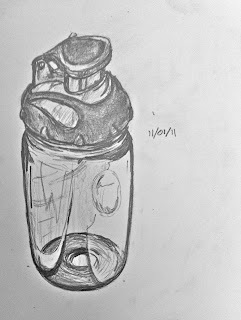 It's a water bottle made out of a matte rubber, somewhat reflective plastic, and a highly reflective clear plastic base. It somewhat astonishes me that I've never really put much effort into drawing textures before, and this seems like a massive oversight in my training. I've also never done a drapery study, and only once a perspective study. Really. Yet I have a BA in Art with Great Distinction. So I've decided it's time to start remedying this giant oversight in my education, and will start putting aside a certain amount of time every week, probably three hours or so every Saturday, to work on these things. While I was thinking about this, and coming up with a few things to practise, I googled 'drawing rudiments' to get some ideas. One of the articles I came across, targeted to beginners, talked about how important it was to put 'emotion' in the drawing, and let the 'spirituality' of the artist or drawing or something come through. (Rough paraphrase). How completely ridiculous! Drawing is a skill, just like any other, and it takes hours and hours of practise to know what one is doing. Style will develop with time, and only truly skilled artists will be able to put emotion into a piece of artwork. Forcing this at the beginning, especially for a beginner without basic skills or knowledge, is much more damaging to someone trying to learn what they are doing than it is a learning experience. One must learn the rules before one can break them. Furthermore, this idea perpetuates the myth that art is some kind of mystical practise, and that talent simply descends on a chosen few. This notion keeps non-artists, and potential art-lovers at a distance, and blames the viewer for not appreciating the artwork instead of ever entertaining the notion that the art itself might be to blame. Art is not made only for the chosen few who know the right words, wear the funny clothes, and raid the buffet at a gallery opening. It would be fairer to the viewer, to the veteran artists who have put the effort in, and to potential artists to admit that art is just a skill, and like anything else, will take a very long and frustrating time to master. And then show them the Sistine Chapel so they can see that it will be worth it.